There has been much excitement, and a fair amount of derision, centered around the Max Scherzer contract. I’ve already covered with some oversimplified analysis why, thanks to the time value of money, the $210 M contract will cost the Nationals much less in today’s dollars. But a bunch of MLB execs don’t like the move, in part because the Nats will be paying Scherzer forever. Forever is a long time, even if in this case it only seems like forever, as the payments end in 2028. 14 years is a long time to pay someone, though, when they won’t even be on the team for the last 7 of them. But $15 M isn’t going to mean the same thing at the end of that contract, and it has nothing to do with the time value of money. Instead, it has to do with the payrolls in Major League Baseball. But before we peer into the future, let’s take a look at what the MLB average payroll has looked like since 1998, and what percent of that average team payroll Max’s $15M actually is. This shows that someone making $15 M in 1998 would be eating up 37% of his team’s salary. By 2000, it was down to 27%, it dropped below 20% in 2006, below 15% in 2012, and in 2014 it was down to 13%. Of course, the Nats aren’t the average team. Over the majority of this time, much of it as the Montreal Expos, their payroll was below the league average. But in 2013 it jumped to $121 M, 114% of the league average. In 2014 it was $137 M, or 119%. The Nats will check in somewhere around $160M in 2015, which seems like an even higher percentage. Now, we don’t know the league average payroll for 2015, but we can take a guess. Over the course of this 1998-2014 timeframe, the league average payroll has grown by around 5.5% per year (3 year CAGR: 6.2%, 5 year: 4.6%, 10 year: 5.2%, 15 year: 6.0%). Applying that to the MLB average of $115 M in 2014, we get a forecasted average of $121 M in 2015. That would put the Nats at 132% of league average payroll. I’d rather not speculate that they’ll end up even higher than the 2015 range, as they hope to see veterans replaced with great prospects in the future. So let’s assume the Nats payroll sticks at a conservative 125% of the average payroll. It starts out at 29% of the payroll, but drops under 20% in 2001, under 15% in 2007, all the way down to 10.4% in 2014. It’s still a big chunk, and the Nats new ace will be making around 9.3% of the team’s projected salary. No small portion for one guy, but nothing crazy for a star. But the whole point of this isn’t to discuss what Scherzer will be making now compared with the rest of the team, or even in the near term. It’s to take a look at what it might look like later, when he’s not even pitching for the Nats. So let’s continue with that assumption, that MLB payrolls will continue to grow at a rate just below a Southeast Asian economy, at that 5.5% rate we calculated earlier. Assuming the Nats payroll remains at 125% of this average payroll, it would grow at the same rate, and Scherzer’s salary would start to look like a smaller and smaller portion of it. Note the changes in scales – the right axis had to grow for obvious reasons, but the left axis needed to change in order to see what was going on there. 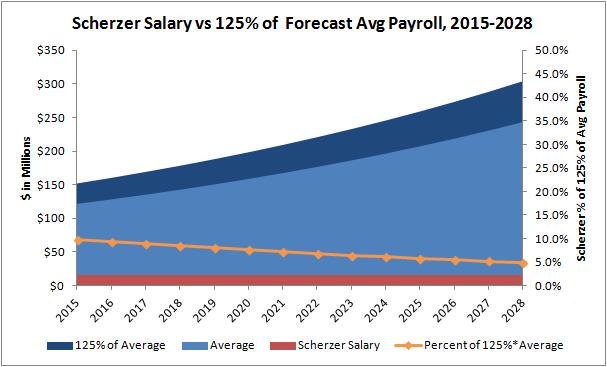 I didn’t use the Nats 2015 salary forecast for the chart, rather, I kept our 125% level. 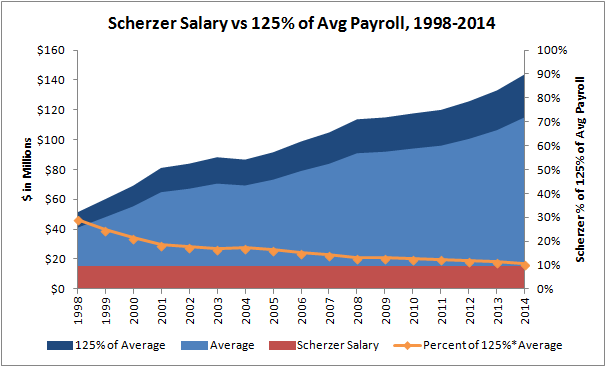 What it shows is that Scherzer’s salary, 9.9% of the 2015 number, drops down to under 7% in 2022 (his first year of being paid for not playing in DC), under 6% in 2024, and under 5% in 2028, the final year of his contract. 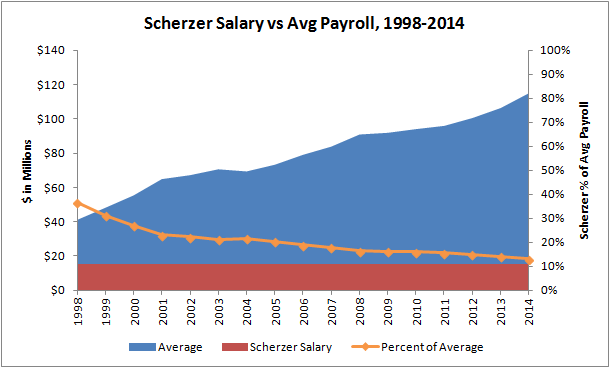 With a conservative estimate of growth rates, Scherzer’s salary will clearly be less onerous to the Nats at the end of the contract, in terms of tying up salary. I’m not going to pretend that 5%, 6% or 7% of the team’s salary is a small amount, especially when it’s to pay a guy who is retired, or pitching elsewhere. It is, however, about half as much of the team’s salary by the late 2020s as it will be in 2015. And that, coupled with the relative (for a free agent of his caliber) low cost he is now, makes for a pretty good deal. This is, of course, not to say that people won’t be complaining about Scherzer’s salary in 2025. But it gives some perspective on why that $15M per year won’t be as hard to deal with as it would be if they were doing that for someone today. One additional point on the growth rate – the inflation rate has been relatively low over this time period, under 3% in almost every year. As the US economy continues to grow, there is a decent chance that inflation will accelerate. Some of this will be reflected in the 5.5% salary growth rate we’ve already built in, but bigger inflation would suggest a bigger growth rate. That, plus the fact that we used a conservative number, could easily push Scherzer’s not-appearing-in-this-film year salaries down to the 3-4% range.